This product information page is designed to help you decide whether the Lindy IR over HDMI extender kit is right for you. It includes links to the top online retailers’ websites to save you time finding the best deal. Where to find the best price for the Lindy IR over HDMI extender kit. The Lindy IR repeater cable lets you control an audio-visual device, using its existing infra-red (IR) remote control or a universal remote control, in situations where the device are hidden out of sight (for example, in a closed cabinet). Can be extended to control up to three further audio-visual devices. Uses an existing HDMI cable to relay control signals. 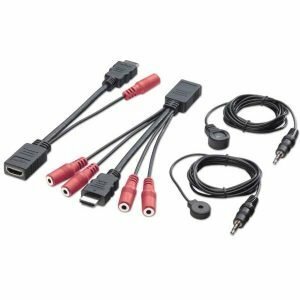 An HDMI cable connecting your source equipment to your display equipment. The Lindy IR repeater cable comprises an IR receiver, an HDMI injector, an HDMI splitter and an IR emitter. The HDMI injector connects to your HDMI cable at the display equipment end and the HDMI splitter connects to your HDMI cable at the source equipment end. The IR receiver connects to the HDMI injector and the IR emitter connects to the HDMI splitter. Place the IR receiver in sight of your own remote control, and the IR emitter directly over the IR receiver of the audio-visual device you want to control. Simply operate your remote control whilst pointed at the IR receiver and the IR emitter will relay the control signal to your equipment.